This item is selling for $24.49 on eBay. 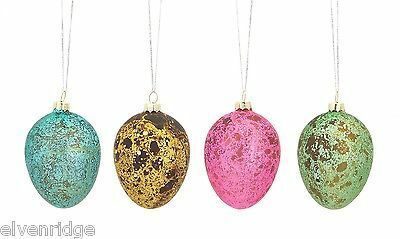 Blown Glass Spring Easter Eggs Set of 4 in bold colors w metallic finish. You will receive four in the set, as shown. 4 inches tall. Can be hung in a window or Easter tree or other display. Could be used on mantel or other holiday display. Perfect spring pick me up! Super cute eggs, made of glass!